SAN FRANCISCO (AP) Jose Quintana told Kyle Hendricks he would do all he could to follow him with another strong start by the Cubs rotation. This is exactly what manager Joe Maddon hoped to see: the pitching getting on a little roll and hitters doing their part as the second half nears. Victor Caratini hit an RBI double during a decisive seventh inning, helping Chicago back Quintana in a close game and beat the San Francisco Giants 2-0 on Tuesday night. 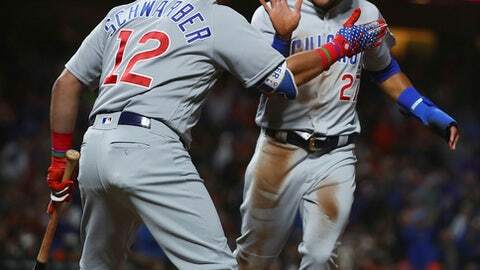 A night after losing 2-1 in 11 innings despite a strong start from Kyle Hendricks, the Cubs had enough offense for Quintana (8-6) – and they could have a healthy third baseman Kris Bryant back in the lineup for Wednesday afternoon’s series finale. Quintana allowed three hits in six scoreless innings to beat the Giants for the first time in his career after the lefty went 0-3 with a 5.82 ERA over his first three starts. Carl Edwards Jr. struck out the side in order in the seventh, Justin Wilson followed with a perfect eighth and Steve Cishek closed it out for his third save after taking the loss Monday. Maddon said afterward Brandon Morrow wasn’t available for the ninth because of a planned second consecutive day off. The Giants got just one baserunner over the final four innings. Holland struck out eight and didn’t walk a batter in 6 1/3 innings. Johnny Cueto had been the announced scheduled starter, but manager Bruce Bochy gave Cueto an extra day to recover, something that could be the norm in the second half for the veteran right-hander. Holland has been versatile: In less than a week, he pinch-ran, pitched twice in relief then returned to the rotation. Giants center fielder Gorkys Hernandez returned to the lineup after missing Monday’s game nursing a tight calf that forced him to an early exit Sunday against the Cardinals. Aside from a pinch-hit appearance in the eighth, Buster Posey had the night off for the Giants and was scheduled to catch the day game Wednesday. He has to skip the All-Star Game because of a lingering right hip injury that will require an injection. Former Giants third base coach Tim Flannery will handle public address announcer duties for Wednesday’s series finale as Renel Brooks-Moon participates in San Francisco Mayor-Elect London Breed’s inauguration. ”A great honor for both of us,” Flannery posted on Twitter. Cubs: Bryant was headed to the Bay Area hoping he will be ready to come off the disabled list and play Wednesday afternoon’s series finale against the San Francisco Giants. Bryant, out since June 23 with inflammation in his left shoulder, played rehab games for Double-A Tennessee on Monday and Tuesday. He had hoped to re-join the Cubs during their series at AT&T Park. Giants: 2B Joe Panik will be out at least a few weeks with a strained left groin. Panik hopes to begin light movements this weekend to test the tender leg, noting ”nothing was torn off the bone.” … 3B Evan Longoria, three weeks out from surgery on his fractured left hand, is doing more baseball activities such as taking groundballs, working on flips, playing catch and hitting off the tee. ”I feel on track to being where I need to be,” Longoria said. … RHP closer Hunter Strickland had pins removed from his surgically repaired broken pitching hand that he injured punching a door in frustration after blowing a save against the Marlins on June 18. Cubs: LHP Mike Montgomery (3-3, 3.68 ERA) is 0-1 in four career appearances against the Giants with two starts, posting a 3.78 ERA with one save. Giants: RHP Cueto (3-1, 1.95) makes his second start since coming off the disabled list from a 61-game absence with an inflamed pitching elbow and seventh overall in 2018. He is 9-9 in 25 career starts vs. the Cubs.